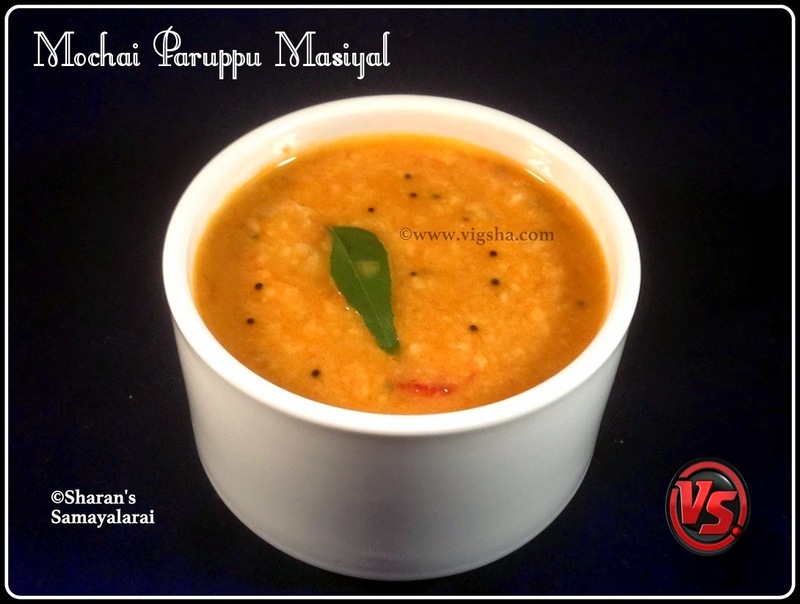 Mochai Paruppu |Val Dal is widely used as a food crop throughout the tropics, especially in Africa, India and Indonesia. Like other lentils, it also has good source of protein and dietary fiber. This dal cooks quicker than most lentils and has very slightly bitter flavor. 1). Heat a tsp of oil in a pressure cooker and add mustard. Once mustard splutters, add onion, curry leaves and saute till it turns translucent. Then add hing and give a quick stir. 2). Add tomatoes and saute till it turns mushy. Then add turmeric powder, salt, chilli powder and saute. 3). Add mochai paruppu along with water and castor oil. Close the lid and cook for 2 whistles or until soft. Open the lid an mash the dal with the laddle/masher. Mochai Paruppu Masiyal is ready. I served it with spicy Avarakkai Poriyal.